The facade is being temporarily braced for structural safety. We are in the fourteenth week of the project, and work has moved out of the basement. The plan to work from the bottom up meant that much structural work on the house has gone unseen for the past three months. In the cold of winter, the preservation carpenters worked to use the snow to their advantage. Sliding oak beams and timbers weighing over 600 pounds on the snow allowed them to slip through precut holes in the foundation. Once deep inside the depths of the house, the beams were jacked into place and in some cases sistered to original materials to preserve the artifacts of the house. As the trees begin to bud out, and life returns to the Tilden Meadow, there are obvious signs that the work has progressed significantly. As you look at the facade of the Tilden, the clapboards have been stripped and it is easy to observe the skeleton of the timber frame. There are gorgeous hand hewn timbers, notches cut by David Tilden himself, and plenty of evidence of First-Period joinery. And, while there is joy in seeing what evidence has survived, there is also dismay at the extent of the ravages of time. The powder post beetle has had a feast, water and wind have worked their decay, and of course time has taken its toll. Work done in the 1970's was done using very modern framing techniques which pose new challenges today when deciding how best to treat these parts of the structure. Today, the work is obvious and direct. People who walk past the fence can see the changes. Structurally, the Tilden House gets stronger every day. And to do so means that it sometimes is even more precarious than it was prior to the work starting. It is the paradox of the project. To make strong there is risk. The walls are now exposed and temporary bracing is used inside and out to guard against the potential for gale force spring winds. Steel columns are installed inside along the summer beam to help support the interior while the exterior framing is being repaired. A series of jacks are used to gently lift and drop the entire building onto new oak sills. At the same time, a transit ensures that for the first time in perhaps a century, the building is now level again. In some cases the building has been off by more than five inches. As you look at the corners of the building where the corner posts attach to the girts (the key horizontal timber that connects the posts to the second floor) there is a gap of a a few inches. The corner posts and the girts have pulled apart with time. The pegs that held them together have been torn asunder and the house will need to be tightened. A plan is on the table to use steel chains and a winch attached to a block deep in the basement and literally tighten the entire house to bring it back into plumb. It is a plan of ingenuity and will allow the house to have a straight roofline and impressive strength once again. The men working on the house today share the same passion as David Tilden. They are men that understand what can be done with their hands and minds against difficult odds. Working with minimal tools and raw materials, the craftsmen are placing their lasting workmanship on a house that will have integrity for however long it survives. Spring has come to the Tilden, and in this second season we are seeing rebirth and the blooming of the project. It is indeed a season of delight. Evidence of the marks of a broad axe. Jim Roache, a fellow curator from the Canton Historical Society, stopped by today. We walked around the building together and near the front door we saw something very special. At the ground, from out of the muddy grass we saw a spring crocus. Purple and yellow with tender green leaves, the crocus greeted us with the joy of another Spring at the Tilden House. That's the thing about what we are now doing. Small things start to become illustrative of a larger story. We now see nails protruding from the beams in what was the kitchen and instinctively we know that at one time, fine herbs once hung from that same spot. We are looking at so many new things everyday. 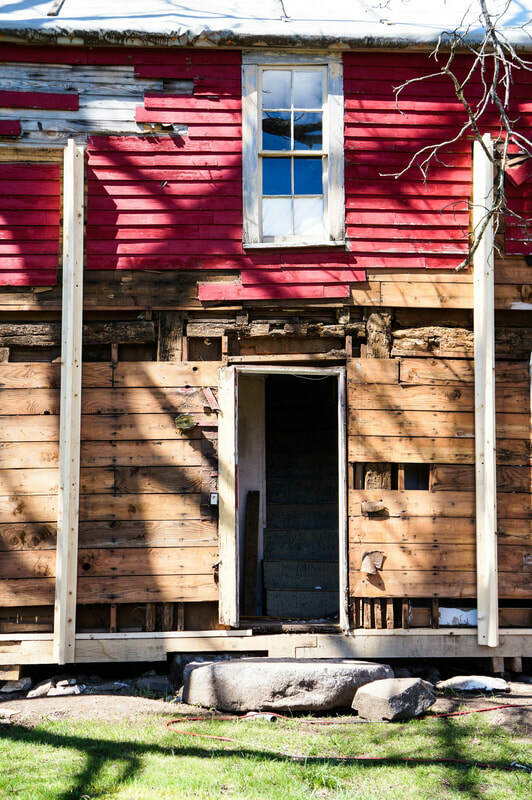 The remarkable thing about this project, is that in doing the work today, the preservation carpenters are using some of the same techniques that have been employed in timber frame construction for the past several centuries. As you walk through the project, the oak timbers are cut with painstaking precision. There is a quality in the craftsmanship that will speak through the ages. The visitor is hard-pressed to find modern materials at this site. Yes, there are a few power tools, but still the old ways are the best ways. The men working at the Tilden are craftsmen, and they take great pride in their work. Chisels and ice tongs liter the work zone, and even scraps and cribbing are employed when needed for a shim or temporary brace. The timbers that are being replaced also tell a story. The marks of the tools that fell the chestnut trees in the 18th century help us see the house in new ways. Gerry O'Doherty pulls out a large bean and shows the marks on the side, "this beam was shaped with a broad axe," he explains. O'Doherty has an instinct that is supported by more than three decades inside really old houses. A natural teacher, O'Doherty shows me the marks, and explains how the tree was felled, shaped, notched and formed to become the beam at our feet. The, O'Doherty goes on to describe the tool itself. Waxing over the description of a goose-neck handle and finely sharpened edge, it is as if David Tilden is describing his work back in 1725. It's a joy to learn so much from a single block of wood. It's been a good season for the preservation crew. The weather has been cooperative, and snow stayed at bay for the most part. Inside the basement, where the bulk of the work has progressed, has stayed fairly tight and has not presented nearly any surprises. From an engineering standpoint, the new oak timbers are impressive. On a recent visit we found that the structural engineer has added three new footings below the oldest section of the house. The new support frame, in many cases, is being sistered alongside existing beams. Visitors to the Tilden in the future will be able to see the new work being done today alongside the preserved work that dates to the original builders of each phase of the house. Soon, the carpenters will be out of the basement, and as the weather gets warmer we will see increased activity outside the house. The transformation is slow and steady. We remain on budget and on a timeline that brings us into the mid-summer for the completion of this phase of work. Each and every time we visit, it is a joy to see and learn more about this place. The trees were felled quite recently, and the white oak timbers are still green and soft. Harvested using sustainable forestry techniques, the enormous beams are now being hand-notched and slid into place in the basement of the Tilden. The snow has helped provide a ready-made skid as we move the beams weighing hundreds of pounds. Techniques we are using to preserve the house are essentially the same methods that David Tilden used to build his home almost three-hundred years ago. This past month, we have found some very special evidence of early first-period building workmanship. It is an exciting time to be a part of this project. 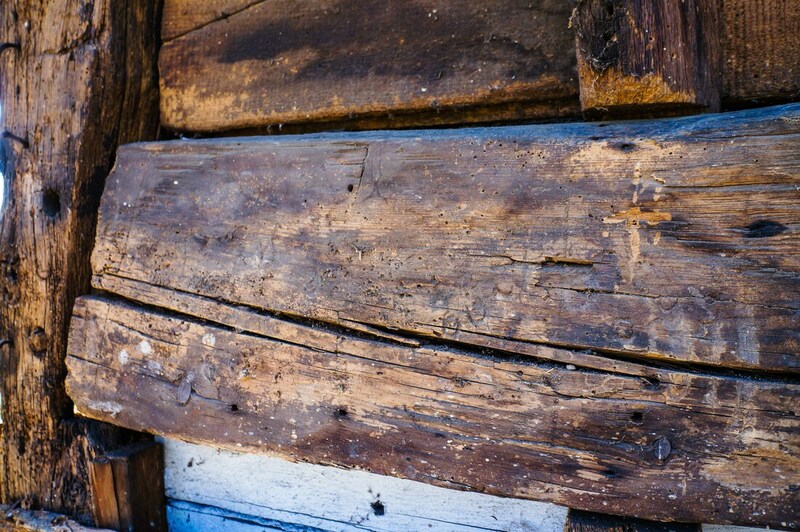 In the oldest part of the house, built as early as 1707, we discovered unique interior panels that are splined together and show evidence of a simplistic decorative bead. And, in another section of the house we found two original windows that may date to the within a few years of the 1725 construction date. And, when opening up the basement floor to pour new footings, we surprisingly found the original footings that David Tilden placed when the house was originally built. Almost three-hundred years of engineering comes full circle in the basement of this historic site. And then there are the random discoveries that hint at the personalities of the people who once lived here. At the bottom of the basement stairs, a small artifact was discovered in the dirt floor. Certainly not old, but a clue that children played here in the early 20th century. A toy fisherman made of some heavy metal and in near perfect condition. Long lost, long forgotten, and now discovered. It's a wonderful found object. Over the next few weeks, as the timbers get replaced and the pulse grows stronger, we will bring back the historic building experts to help us understand and place into context the building now revealed. Also, we will begin to schedule tours for the public to come and see the project up close. We all share in the discovery and learning process. Each day we draw the building further away from extinction and into the relevancy of enhancing our place in history. The building speaks, and we are listening. The phone rang at 3:32 am. It rang again at 3:45 am. Both calls went unanswered. When I woke at 4:45, I instinctively turned to my phone to check the time. Bleary eyed I saw that there were two missed calls. The first was from the alarm company monitoring the Tilden House. "This is James, this call concerns the Canton Historical Society and 93 Pleasant Street. At 3:28 am we received a fire alarm in the first floor smoke detector. The fire department has been dispatched." My heart sank. For so many moments over the years I had an image of how this project could end, and fire has always been a great threat. After all, this is a wood frame building and with over three centuries of history, wood buildings are at great threat from flames. The house has been protected as best possible. Most of the electricity has been removed, smoke and motion detectors monitor the building 24/7 and exterior lighting has been added to make sure it can be well observed from the street. All that said, fire is always a possibility. There was a sense of foreboding and I scraped the frost from the windshield and headed out in the darkness of the morning. In the driveway I sniffed the air for smoke and looked to the north of my house for any signs of fire across the swamp towards the Tilden. As the car warmed, I imagined that the money raised would need to be returned. Letter's would be written, tears would be shed and the town would mark the loss with a plaque. I drove faster than I should have. A bright moon shone over the Reservoir as I searched for tell-tale emergency lights in the meadow. I even imagined how the television news reports might cover the loss of this already almost lost building. Turning into the parking lot, the Tilden stood strong against the cobalt blue dawn. There was no fire. It was just as it had been the day before. Turning the key in the lock, and accompanied by a Lieutenant from the Canton Fire Department, we searched for the source of the alarm. A smoke detector had malfunctioned in the cold of the December night. The house was safe and sound. When my wife woke up and I relayed to her my pre-dawn adventure, she smiled softly and said, "that house wants to be saved." A mantra that she, and others have said countless times over the past fifteen years. Indeed, that house speaks every time we touch. And, on Christmas Day, the dawn of a new era for this historic site is about to break. The builders will reach deep into the soul of the house and find the weakest of pulses. They will begin major surgery on the vital organs, the spine and the bones of the house. Tilden will speak volumes over the next several months. Today, one of the great gifts that I received was a false alarm and renewed hope that this house wants to be saved. Experts from MHC meet with the architect to discuss the project. The Canton Historical Society signed a contract with Gerard O'Doherty of Lincoln, Massachusetts for Phase I structural preservation work at the Tilden House. This culminates the efforts of preservationists that began in 1973. With close to forty-five years of work, a major milestone has been met to protect and preserve the historic homestead of David and Abigail Tilden. Work is expected to begin mid-December. Earlier this week, the Board of Selectmen executed a preservation restriction with the Commonwealth of Massachusetts to protect the building in perpetuity. The restriction paved the way for a $50,000 matching grant from the Massachusetts Historical Commission. In addition, Governor Baker's Office of Administration and Finance is releasing the $100,000 budget earmark that was filed by Representative William Galvin and Senator Walter Timilty. Taken as whole, more than $500,000 is dedicated to the project. Taken as a whole, sufficient money has enabled the Canton Historical Society to begin work on the nearly three-hundred year old house. The house was built over the course of the years between 1725 and 1747 with a rear lean-to constructed in the late 17th century and moved into place in 1725. The house has had seven owners - including the Town of Canton who purchased it in 1970. When preservation is completed the house will become a study in early architecture and wood-frame construction techniques. O'Doherty has very specialized skills that will be used to replicate early construction techniques. In August 2018 the Canton Historical Society assumed a twenty-five year lease and has begun the restoration as a centerpiece of their commitment to the people of Canton. Plans to share the work and develop tours of the preservation efforts will begin later this Winter. The Canton Historical Society has secured a $100,000 earmark in the Commonwealth of Massachusetts Budget. A contract is pending with the Secretary of Administration and Finance. Through the efforts of State Representative William Galvin and Senator Walter Timility, this money will secure full funding for Phase I structural work. Work is expected to be underway within weeks. The money will be used for windows, structural preservation and additional work to move the project forward on a string footing. Project Architect Lynne Spencer and Historic Consultant Bill Finch inspect the Tilden in 2015. The Massachusetts Historical Commission has awarded a $50,000 matching grant to the Canton Historical Society for Phase I structural preservation of the David Tilden House. This highly competitive grant will bring additional financial stability to the project. As part of the Massachusetts Projects Fund Round 24, the Commonwealth is affirming their commitment to one of the oldest houses in Norfolk County and this National Register property. The house is in grave danger of being lost forever, and this infusion of money will allow for work to begin within the next few months. After more than fifteen years of private efforts, the Friends of the Little Red House and the Canton Historical Society have secured more than $485,000 in overall funding. Placing the house in private hands through the grant of a twenty-five year lease will allow preservation professionals the oversight and care that is needed at this critical juncture. Having the Massachusetts Historical Commission as a partner elevates the work and secures the promise of a permanent preservation agreement for this first-period home. The matching grant will allow the leveraging of Community Preservation Act (CPA) funds that have been committed to the project to stretch even further. Essentially, $50,000 of CPA money will now be matched by the grant from Mass Historical. The total funds available for this project are now estimated to be $410,000. In addition the CPA has already funded structural plans, a historic structures report and project plans at the 80% design stage. Given that plans and bid documents are at an advanced state of readiness, this project is truly "hammer ready." 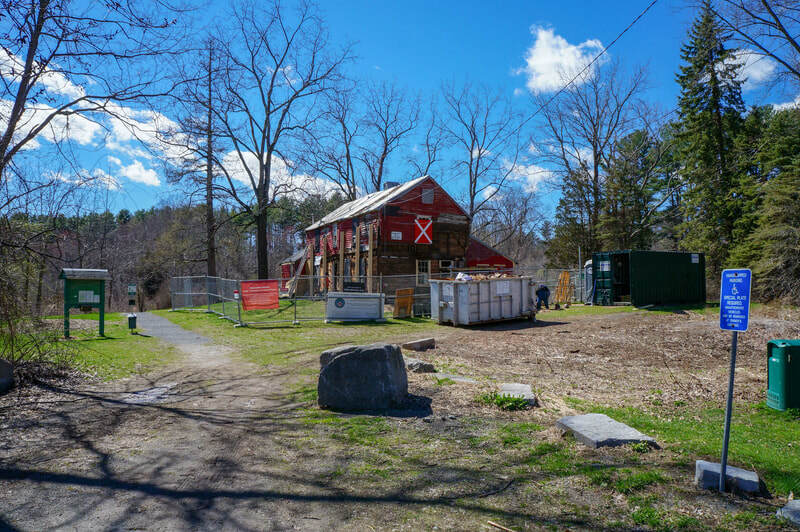 Next steps for the project include additional fundraising, a sign-off from the Board of Selectmen for the preservation restriction and engaging the architect in mobilizing the plans and bidding documents. The Canton Historical Society remains cautiously optimistic that stabilization work can begin as early as September and will be completed by June 2019.